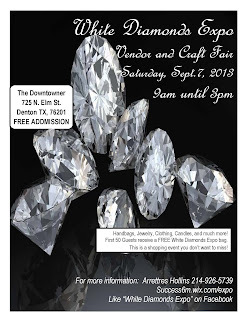 "'White Diamonds Expo' is back. You don't want to miss this exciting, free event where you can shop with up to 50 vendors (depending on location) for that perfect gift for a birthday, wedding, new baby, or any special occasion (maybe even just for you). Hand bags, jewelry, cosmetics, accessories, scrapbooking, clothing and much more. Our vendors specialize in personal attention and will make sure that you make the perfect purchase. You will always find something you must have at our White Diamonds Events! " Booth sizes vary, they will do their best to accommodate vendors' needs. Fee is $60 and includes free electricity and WIFI. For more information, visit their website or contact their event coordinator at success6m@gmail.com / 214-926-5739.
this event was disappointing in that it didn't have good traffic. Radio is best advertisement you can get full results. The community service adds are free. Thank you very much for this information. We will definitely take advantage of this resource.